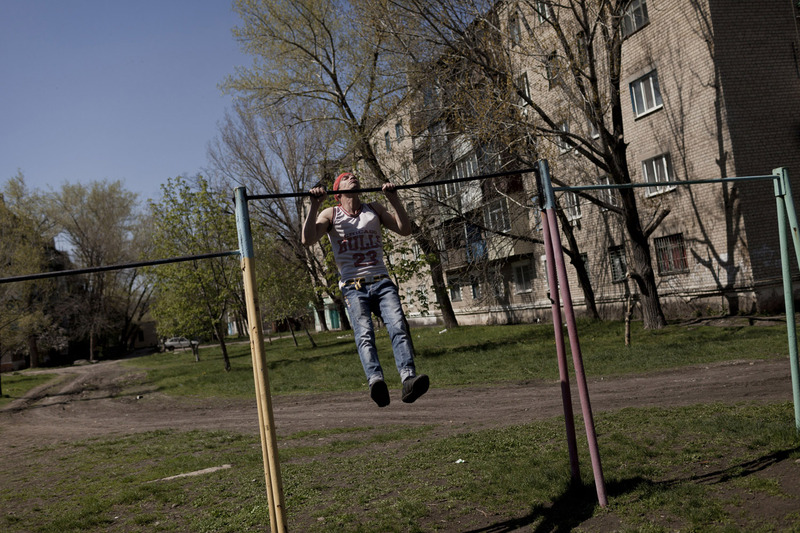 Dima (20), Donetsk. He wanted to be an archeologist, but his parents told him that he would do better to find a job in construction. His father was also a miner, who committed suicide one year after Dima's mother died of a heart attack. Today he works as a miner, “because there is no other choice, and I need the money if one day I want to feed a family”. Krasnodon, a mining town some 5 km from the Russian border. On the background is the defining feature of the Donbass' landscape: the “terrikon”, a mound of debris excavated by a mine. 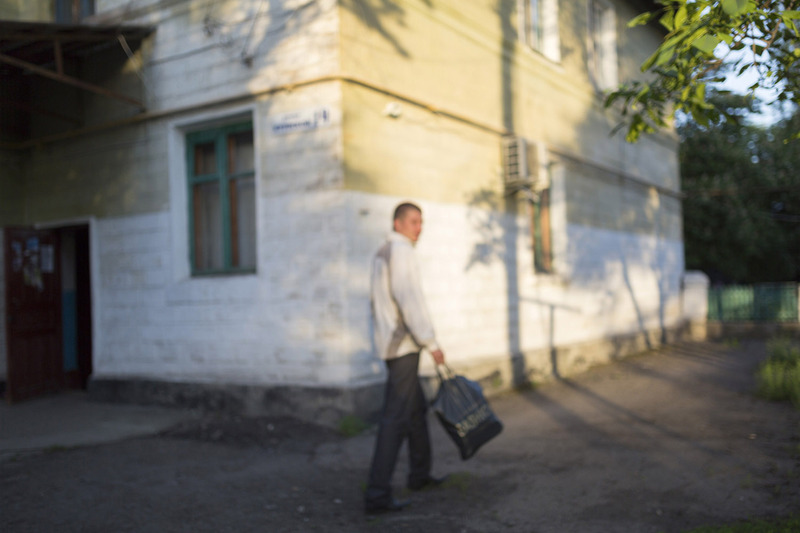 Ivan (29), going to work in Shakhtiorsk at 5:30 in the morning, after drinking a couple of beers. He is married, a few weeks ago had his first child and often jokes on how every day, when he goes to work, he does not know if he will come back alive. When asked if he's afraid, he laughs – “you don't ask this question to a Russian”. Renat (28) and Regina (20), Shakhtiorsk. He has worked in mines for eight years, mostly in illegal ones. They want to get married, but still have not been able to save enough money to do so. A young miner coming out of an illegal mine near Shakhtiorsk. The mine is not operating at full capacity after water begun leaking into the tunnels, making work extremely dangerous. Illegal mines are mostly owned by local criminals who simply took over what in theory is a national resource. The elevator towers of an old mine in Krasnodon. The mines and the equipment they use date back to the Soviet Union. Soviet technology, people say in the Donbass, might not work very well but will work forever. 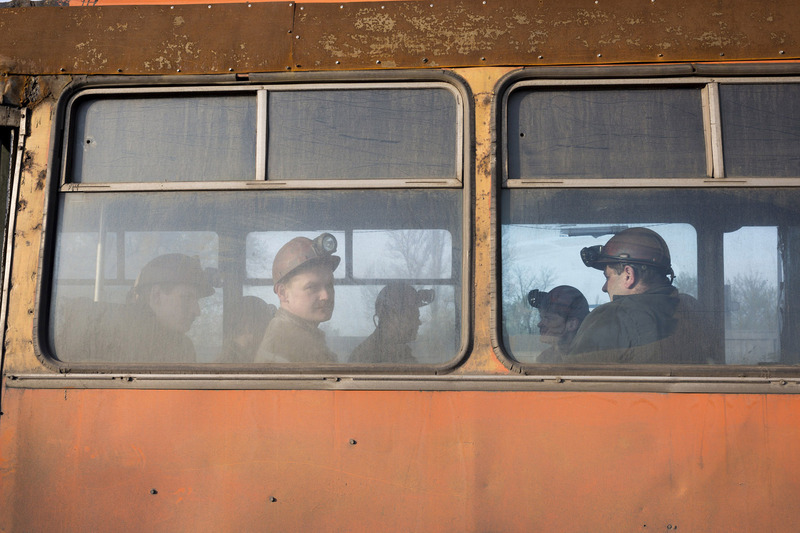 Miners on the bus to work in the early hours of the morning in Makeevka, a mining town on the outskirts of Donetsk. Tolek (21) and Tolek (23), smoking a cigarette after an eight-hour night shift in an illegal mine in Davidovka. The mine is located a few hundred meters from their houses. 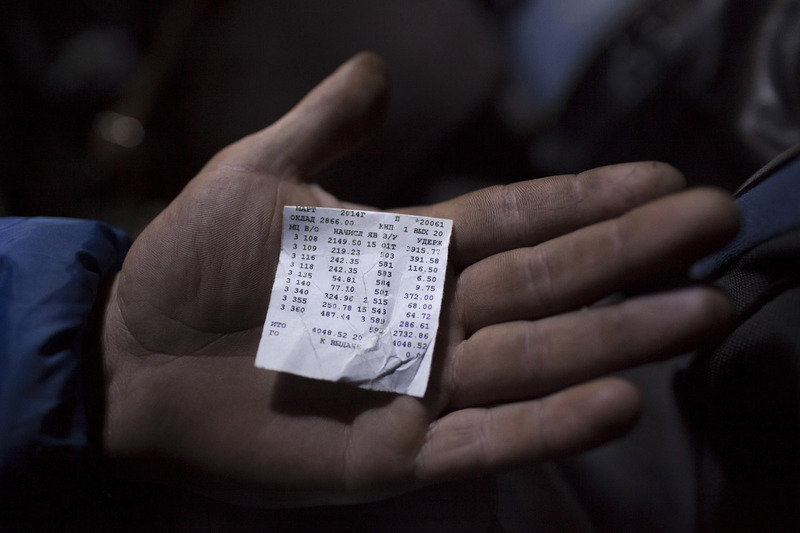 A miner in Krasnodon showing his last monthly paycheck, amounting to little more than 4,000 grivnas, or about 250 euros. The cost of feeding a family can reach 5,000 grivnas, and life keeps getting more expensive, especially since the events at Maidan have thrown the country into turmoil. 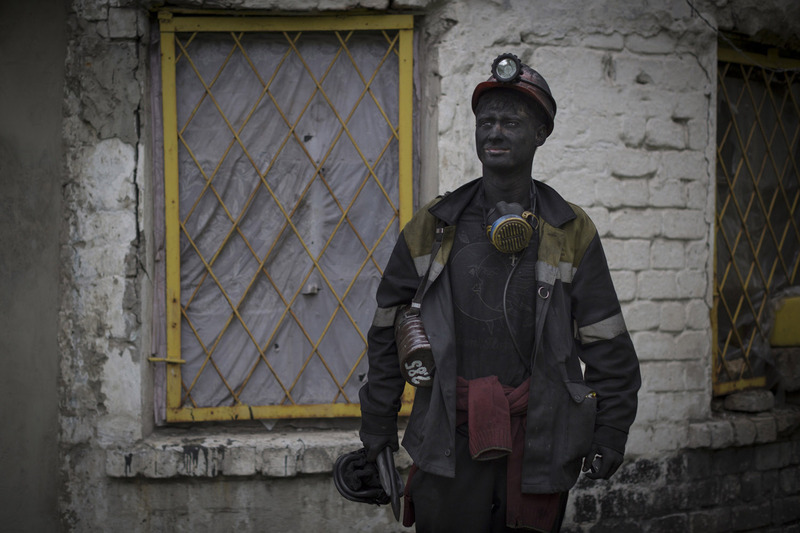 Vasily (24), after his shift in the legal mine of Viktoria, near Shakhtiorsk. Normally he would never let some stranger photograph him. One night, after a few beers, he eventually accepted. When we arrived at the mine the day after he was surprised but among Russian men, as one of his friends explained to us, “if you say, you must do – otherwise you're not a real man”. 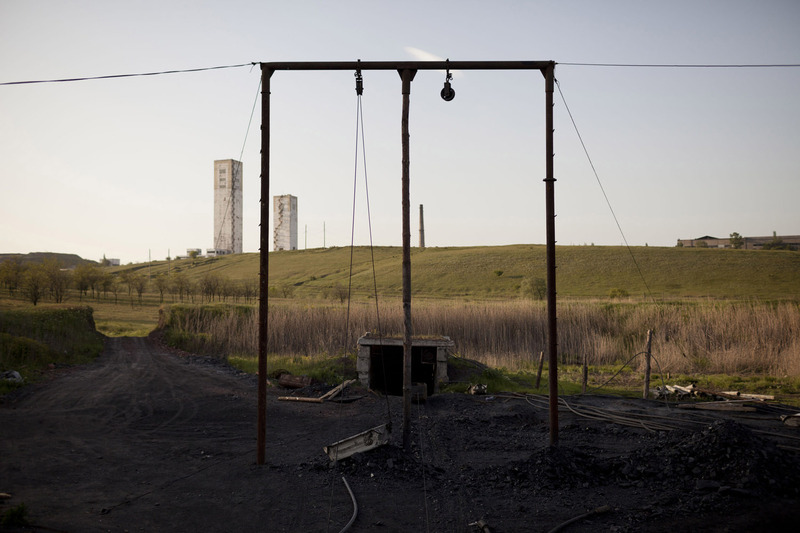 An illegal mine in Davidovka, with the towers of the “Glubje” (deeper) mine rising on the horizon. Reaching 1,650 meters below the ground, the mine is the deepest in the Donbass. 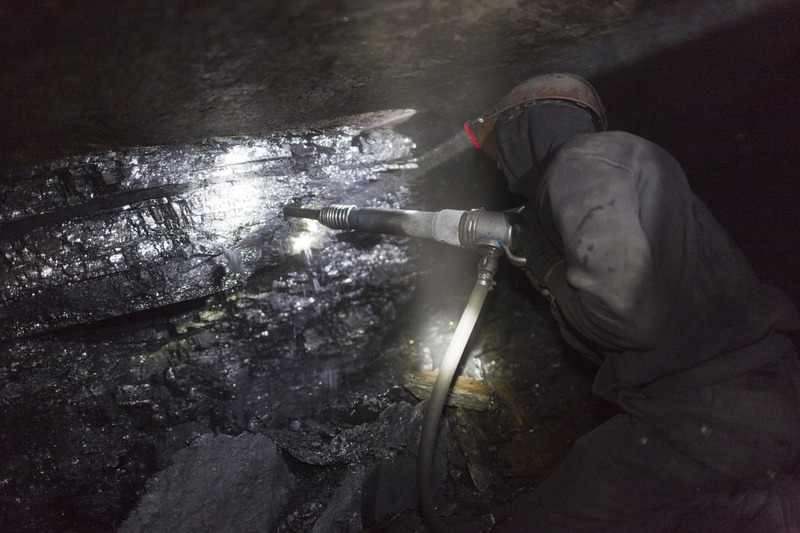 Many miners died in its tunnels, where temperatures can reach 55 degrees Celsius. 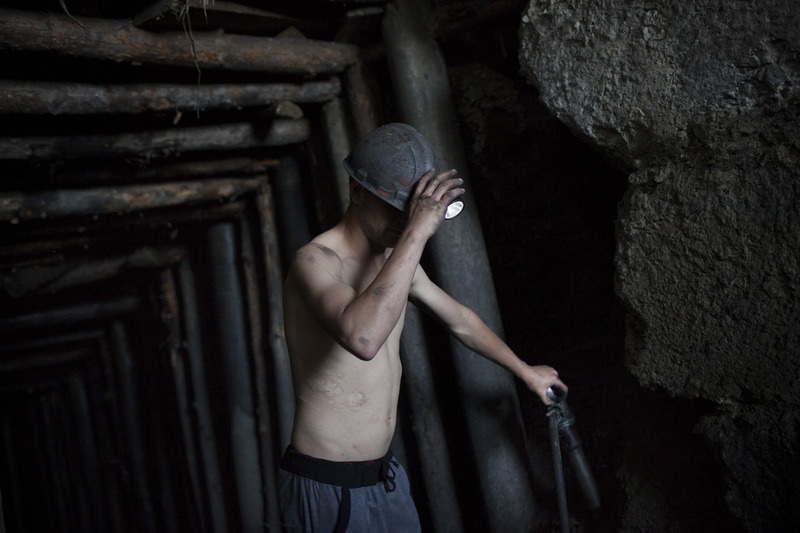 Tolek (23), working several hundred meters underground in an illegal mine in Davidovka. His job is breaking the coal using a jackhammer, at the deep end of a dark and steep tunnel whose average height is of about half a meter. 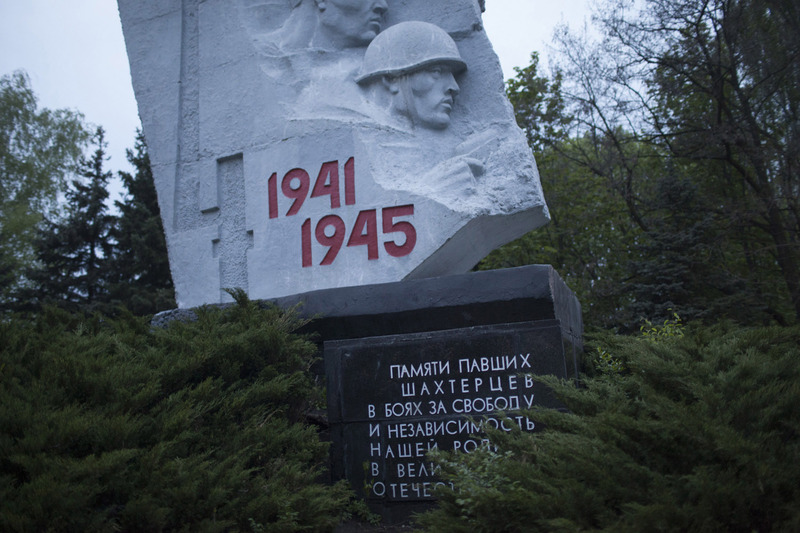 A monument in Shakhtiorsk dedicated to the miners who died fighting in the Second World War, that in Russia is known as the Great Patriotic War. The victory over Nazi Germany, and the enormous sacrifices that accompanied it, are still a central element in the identity of the people of the Donbass. 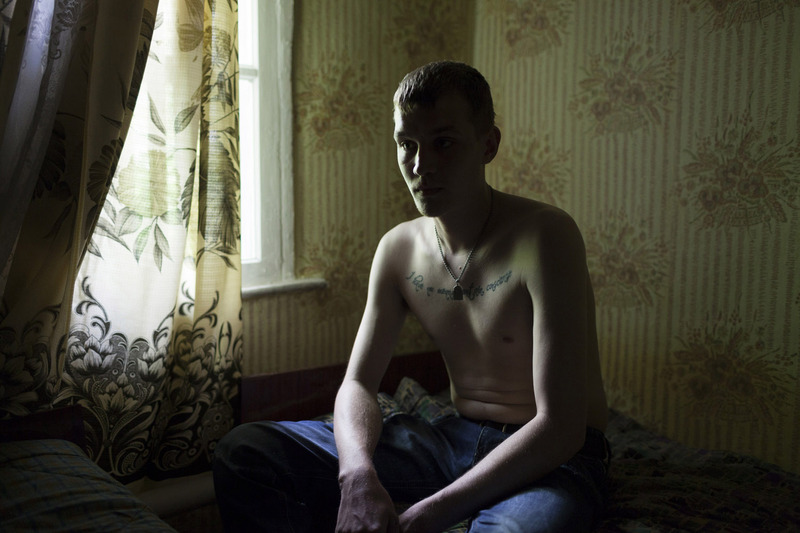 Marek (18), taking a shower after his eight-hour night shift in an illegal mine in Davidovka. The humble conditions in which miners work today are often compared to the times of the Soviet Union, when miners were heroes “who could even smoke where it was forbidden to do so, and the state gave them free milk to clean their lungs from the coal”. 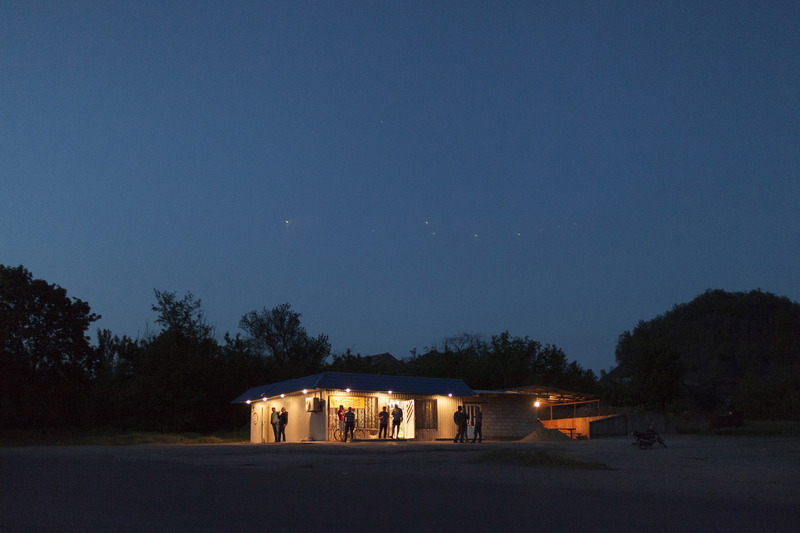 The only shop in the mining community of Davidovka, which in the evenings also becomes the only bar. 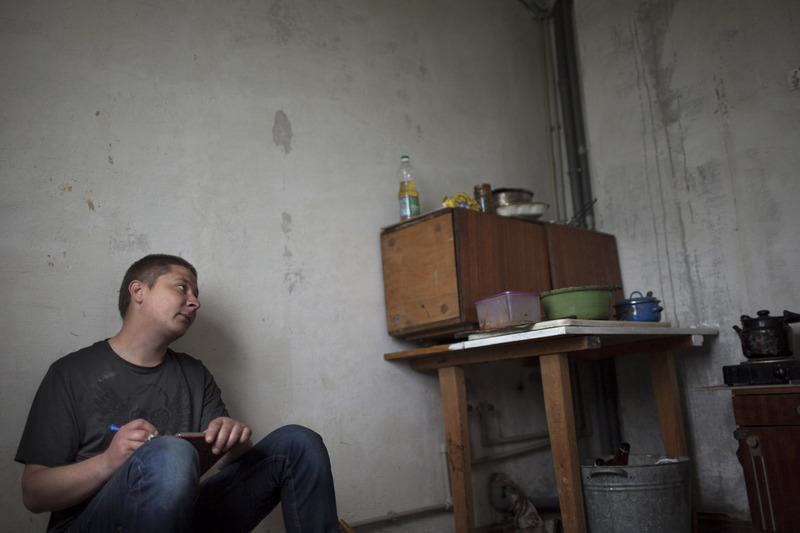 Sasha (30), making a drawing in the kitchen of his flat in Shakhtiorsk. He cannot work because of the internal injuries he suffered in a mining accident, and therefore has no money. His boss claimed the accident was Sasha's fault, and refused to pay any compensation. Tolek (21) and Marek (18) fishing with their friends near Davidovka. Fishing is the main hobby among miners, a much-needed relaxing activity after the stress of working underground, where every small noise might be the beginning of a deadly cave-in or of an explosion. Miners smoking a bong of locally produced weed at a friend's apartment. “Miners work hard”, explained one of them, “and like to smoke harder – only bongs”. 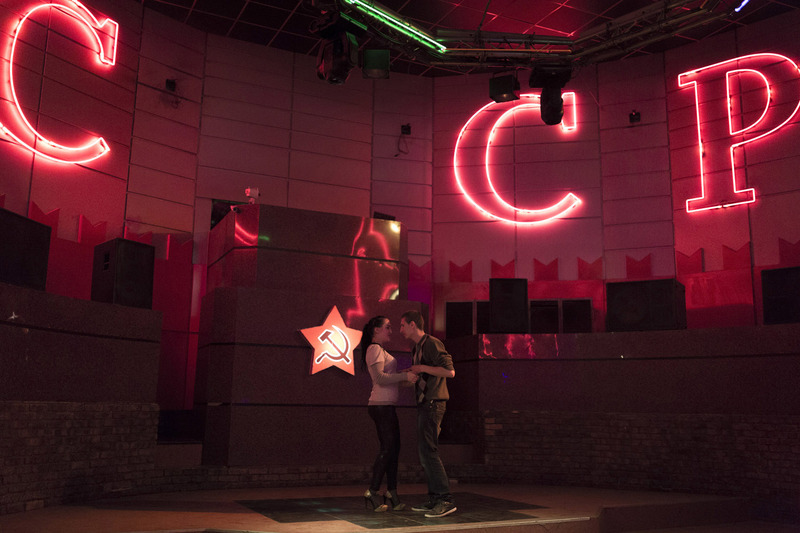 Late-night dancing at the USSR nightclub in Donetsk, the regional capital of the Donbass and the main destination for a special night out. 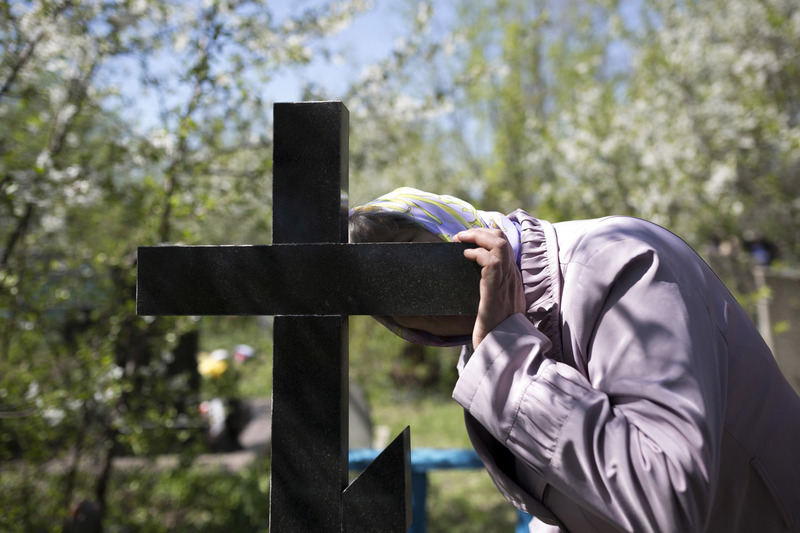 The mother of Andrey Papov, who died at the age of 34 in a mining accident, kisses his grave on the first sunday after Easter, when Russian orthodox families visit their dead relatives, holding a picnic on their graves to spend some more time together. The entrance of an illegal mine near Shakthiorsk. The mine is currently closed after an explosion killed four young miners. 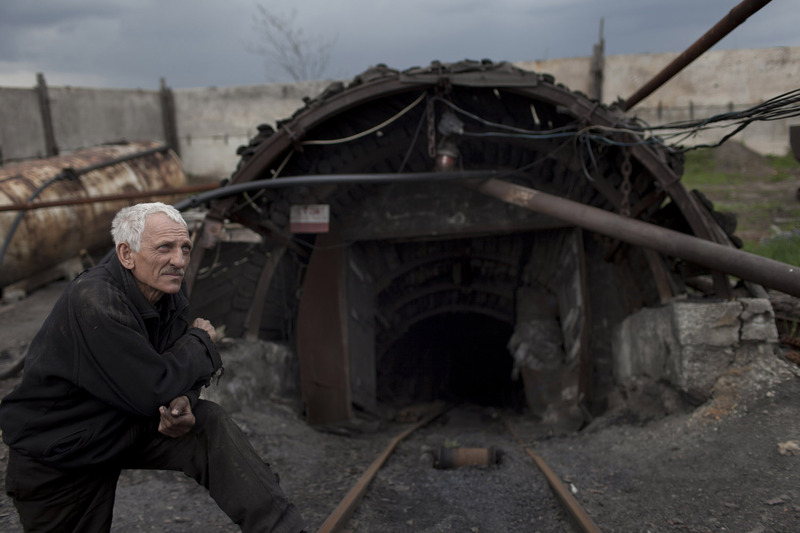 Miners smoke a cigarette at the end of their shift in a legal mine in Donetsk. Working in a legal mine means taking less risks, better working conditions, regular pay and, most importantly, getting a pension. However, for young miners it is extremely hard to find a job in legal mines, especially if one has a criminal record or does not have the right connections. Andrej (27), playing a game of “lientochka” in Krasnodon. Two people challenge each other to do a certain number of pull-ups, adding one more at each turn. His opponent gave up when they reached 11, while Andrej continued on his own. 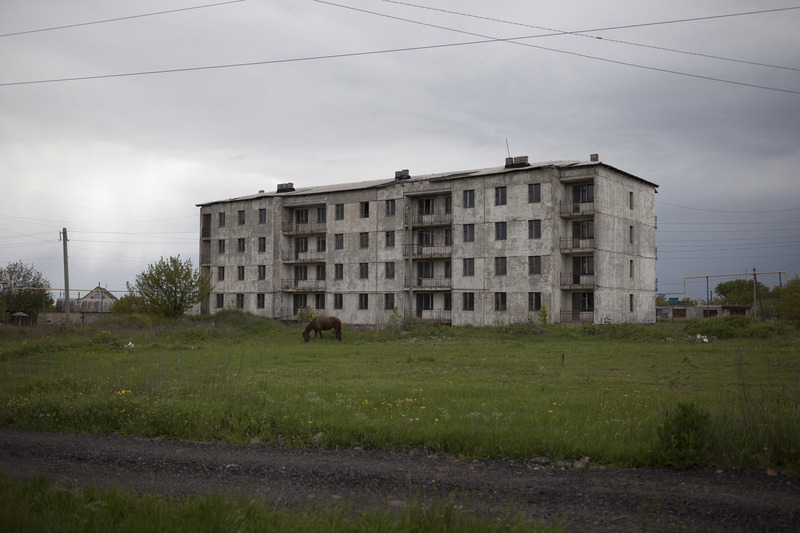 An apartment complex on the outskirts of Shakhtiorsk, whose name itself is a reference to the “shakhta”, the mines which employ the overwhelming majority of the town's men. 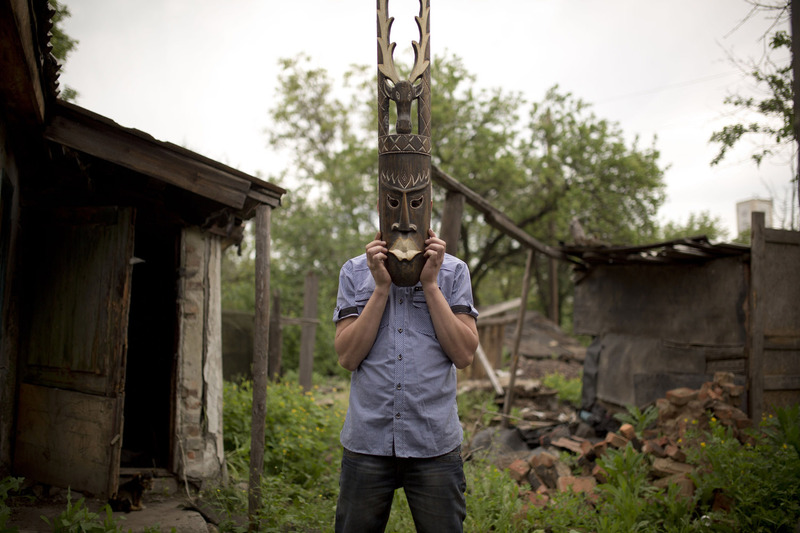 Tolek (23), playing with a mask he carved out of wood. In life he has learned to do many things, including carpentry which is what he would really like to do in life. He isn't too optimistic about it: without money or anybody to help, becoming a carpenter will most likely remain a distant dream, as will the dreams of many other young miners of the Donbass. 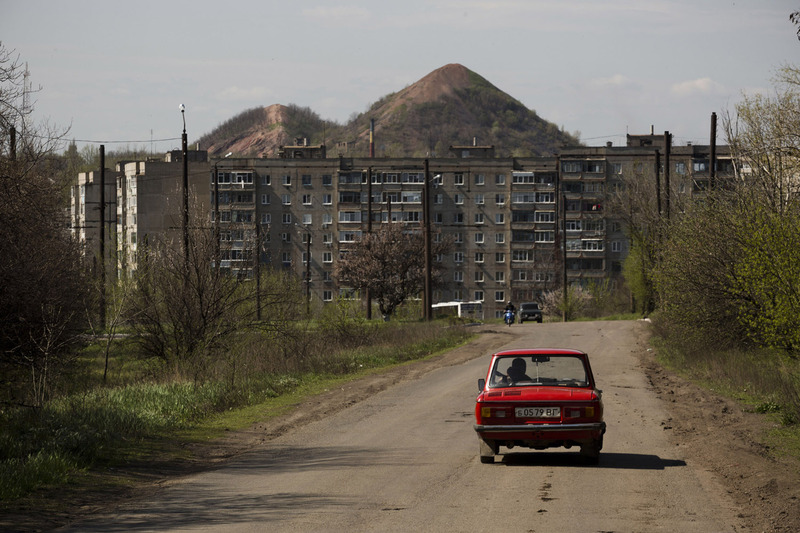 The Donbass is a coal-mining district in the east of Ukraine, lying on the border with Russia and more than 700 km from the capital city of Kiev. Except from some heavy industry and a breathtaking countryside, the Donbass does not have much to offer to its inhabitants, especially in terms of life choices. In fact, for the vast majority there is only one job available, that of the miner. The region might be poor and underdeveloped, but its underground is rich in coal, forcing generation after generation of its young men to embark on a life largely spent in the darkness, digging for the black gold. When asked, no miner will tell you that he likes his job, and in fact most seem to hate it. However, becoming a miner at least offers a measure of financial security, if such a word can be applied to a work that takes place hundreds of meters below the ground, in unsafe and aging mines that claim lives and limbs on a daily basis. Many, and especially the young, can only find work in illegal mines, which are more or less plain holes in the ground, taking even more risks and knowing that they will never get a pension or compensation in the case of injury or illness, two things that are almost taken for granted a job in which every day might be your last. 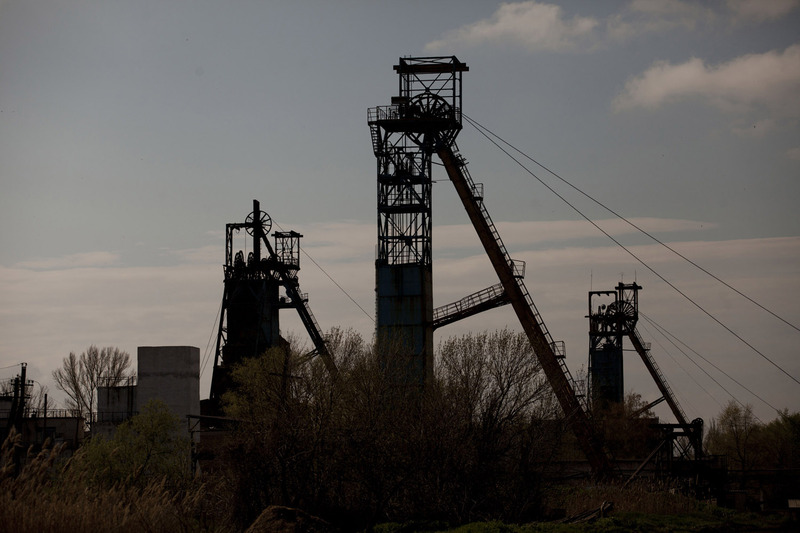 The young miners of the Donbass also face the uncertainties that cloud the future of the region. Dozens of mines have been closed in the last decade because of poor productivity, making thousands of miners unemployed. The prospect of economic integration with Europe to the detriment of Russia, and the adoption of stricter mining standards, alienated miners and played an important role in sparking the current pro-Russian uprising, which in turn places additional insecurity on the entire region, whose youth now don't even know in which country they will live in the future. On their part, the young miners speak, think and sing in Russian, and have little attachment to Ukraine, a country that they feel never gave them anything. They often speak of how the more westernized people in Kiev and the rest of the country see them as ignorant menial workers and show no respect for the hardships and dangers that miners face every day. To them, Ukraine is a failed state, especially when compared to the Soviet Union that they have never experienced. Back then, they say, workers and miners in particular were the backbone of a strong country, and nobody would look down on them. Often having grown up without parents, many of whom died because of mining themselves, the young miners still recall the happier times in which they dreamed of becoming archeologists, carpenters or of having their own business. Now that they are miners, they struggle to not let their work define them and to enjoy their lives made up of hard work, fishing by the lake, drinking and smoking with friends, followed by more hard work. This is the life of the miner, a life that nobody would choose if they had a choice, that choice that nobody ever offered to the young miners of the Donbass.